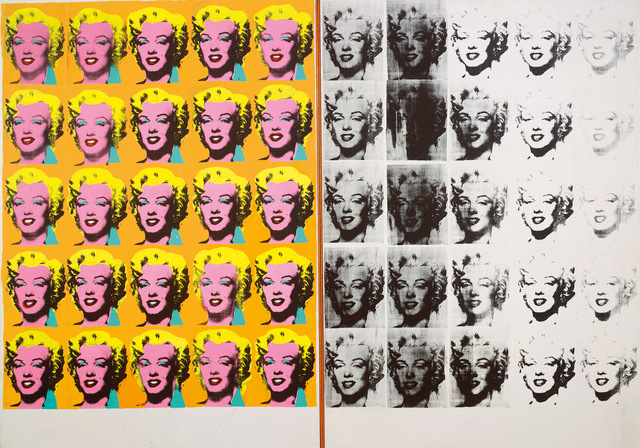 The Warhol exhibit transfers to the Art Institute in Chicago, where it will be open from October 20 to January 26, 2020. The exhibit leads you through the commercial illustrations, personal drawings, paintings, prints, photos, silkscreens, films, videos, music production, his Factory years and more. The last galleries show his giant Mao painting, works in collaboration with Jean-Michel Basquiat, and the 35-foot mural titled Camouflage Last Supper 1986, a rendition of the Last Supper under camouflage print. Throughout the galleries, you can see how he took everyday items and turned them into art, thus redefining art for the modern age. A creative revolutionary, Warhol grabbed elite museum and gallery culture by the throat and flung it into the mainstream of popular culture and celebrity. The first installation at the Whitney is a gallery covered in Warhol’s Cow Wallpaper (1966), where images of hibiscus flowers are displayed. He created the Flower paintings in 1964, using four hibiscus flower images from a magazine and, with the help of assistants, silkscreening them across more then 500 canvases. For his first Whitney retrospective in 1971, the gallery card says, Warhol directed that all his works be hung on the Cow Wallpaper. He was also obsessed with death and disaster and many of his celebrity portraits linked those interests. His portraits of Marilyn Monroe were made after her death in 1962. Nine Jackies was made after the assassination of President John F. Kennedy. His work also included enlarged prints about disasters and several silkscreened works titled Big Electric Chair. He was considered talented as a child and attended free art classes for talented children when he was 9 years old. He earned a BFA in pictorial design at Carnegie Institute of Technology (now Carnegie Mellon University).He moved to New York in 1949 and changed his name from Warhola to Warhol. This article was previously posted on Third Coast Review.